The current Transformers product is a little confusing. On the one hand, we have the Generations line, which has picked up where 'Classics' left off, and is known as Classics 3.0 in some circles. They are going to be (so far) all 'deluxe' scale figures, and are exploring the full and rich universe in some pretty exciting depth. This line is a fan favorite to be sure. Know them by their deep red cards. 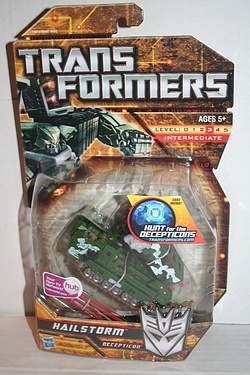 On another hand, we have the sort of anemic yellow/orange cards which denote the Hunt for rhe Decepticons line, which is the successor to the movie line - where the bots still sport that ever-irritating Bay look. However, it's not as simple as that, because while this line does give you movie Ravage, movie Ironhide, movie Prime and you can be sure it gives you movie Bumblebee, it's also offering up some new figures with great design. Taking a cue from Hasbro themselves at Toy Fair back in February, I had taken to grouping the current parallel lines under the umbrella of More than Meets the Eye, 2010. News from Hasbro and research by fans tells us that the new product line, probably hitting stores right after the holidays, will be called 'Reveal the Shield', and I'm sure I'm not the only one who is excited about the return of the 1980s rubsign! It sounds as if it will combine the Generations and Hunt lines into one, hopefully awesome, offering that will simplify our checklists and enrich our collections. Of course, the "movie 3" product will by necessity be showing up shortly thereafter, so we can only hope to get some cool figures from this necessarily short line before it is shelved for the demands of licensing and marketing deals. Well, all of that is a long lead-in to today's figure, of Hailstorm! I really dig this figure, and think that the colors and styling can't be beat. Then you add in 8 firing missiles and I'm smitten. Click the image below for the bio of this clumsy, high powered Decepticon from the soon-to-be-merged Hunt for the Decepticons line!